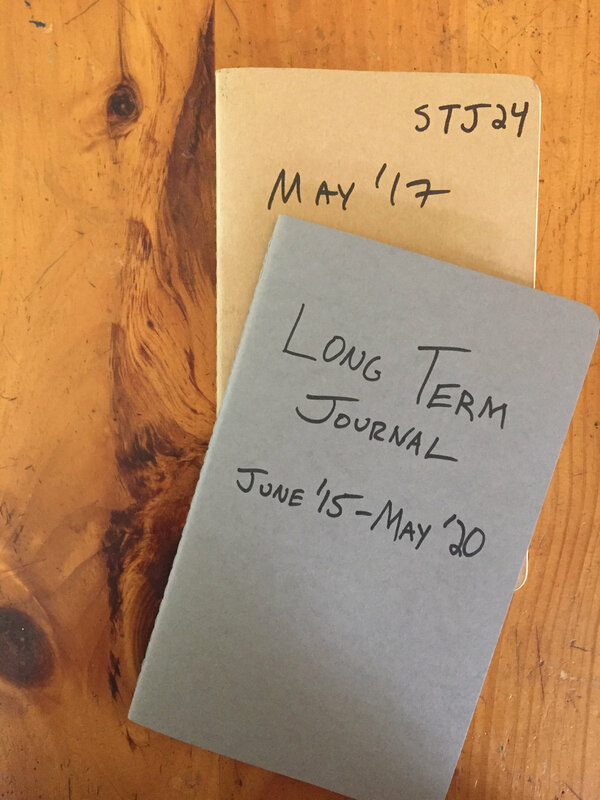 I pursue my long term goals using a set of what I call “productivity journals.” (As featured in Long Term Person, Short Term World.) Although this page is primarily intended to serve as as supplement to my book, there is standalone value too. 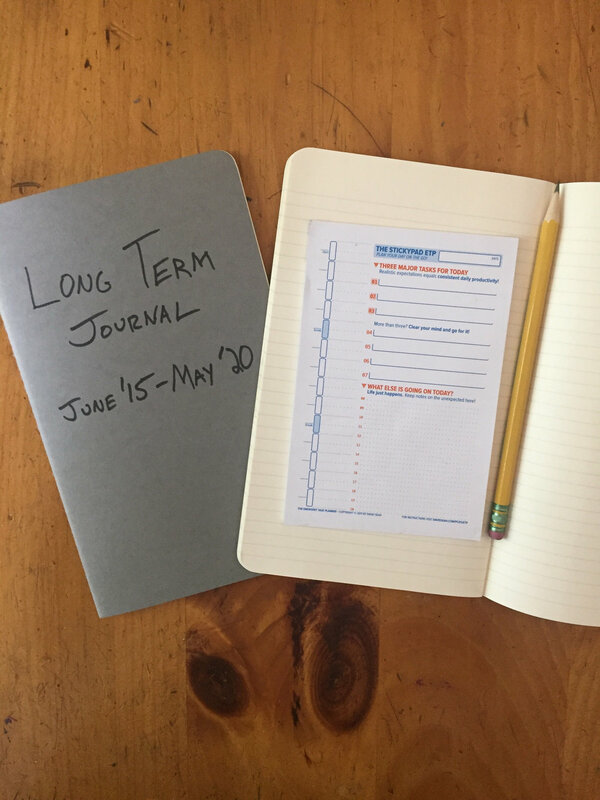 “Productivity journals” are of two types: short term journals (STJs) and long term journals (LTJs.) STJs are maintained on a monthly basis. LTJs are maintained for 5 years. Together the LTJ and STJ are a powerful, synergistic combination: LTJs allow for a top-down approach to goal achievement. STJs are bottom-up, providing an “on-the-ground” perspective that a top-down approach cannot see, and allowing for the flexibility that a top-down approach cannot _fore_see. I had a bad habit of switching from one flavor-of-the-month system to another before switching again—the grass is indeed always greener. I spent far too much time getting ready to get things done instead of actually getting things done. Manage my tasks, time, and goals on a consistent, long term, and realistic basis. Be both creative and analytical in my pursuit of productivity. If it’s easy, flexible, and (sorta) fun, it won’t produce friction—I’ll use it, reliably. 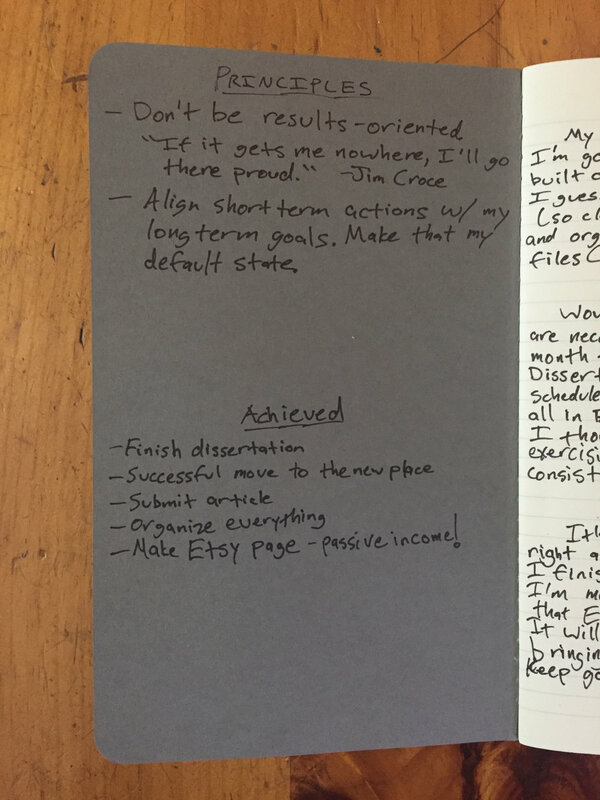 Tasks unrelated to your most important goals are nowhere near these journals. Productivity journals are sacred. In them, you will uncover amazing, actionable truths about yourself—this won’t happen if “buy toilet paper” is a few lines up. Daily, (relatively) freeform journaling is a critical component of STJs—in fact, most of the pages are dedicated to this habit. It is the cornerstone habit upon which your productivity—task, time, and goal management—is built. 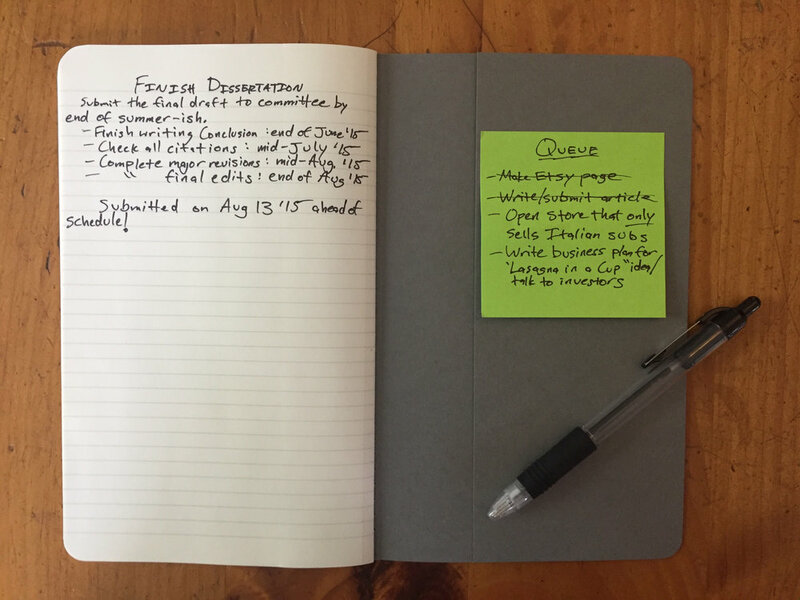 Journaling, whether by the method described here or otherwise, has enormous benefits. 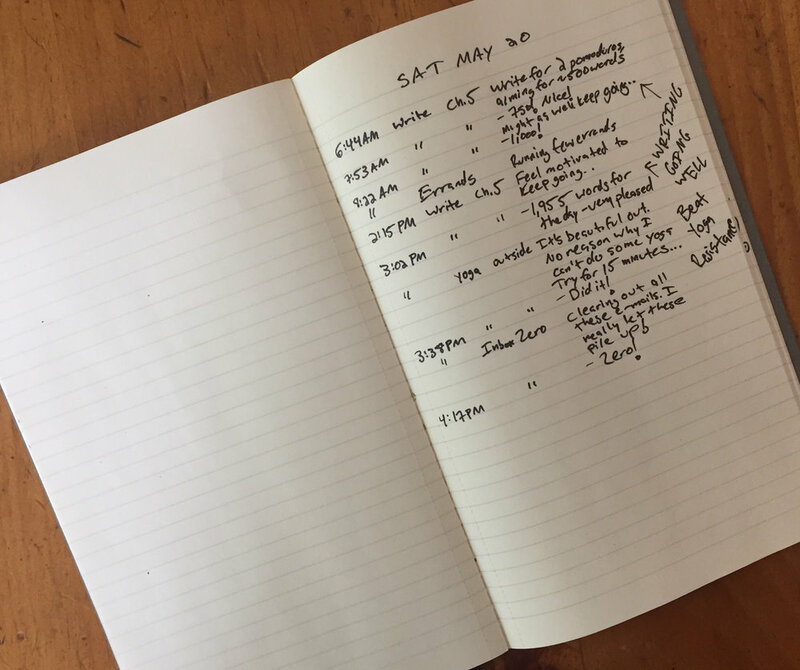 Equally important, journaling is easy, which means it’s an easy habit to start and stick with. You literally just move your hand around a page or type into your computer. It almost doesn’t even matter what you write or type—it’s just the act that matters. Perhaps the greatest benefit is journaling ability to help us understand our mental models and improve our emotional intelligence (EI).The interference of mental models and low EI are the greatest impediments to personal productivity and sound goal management. So, yeah, I’m a big fan of these journals. But there are plenty of other journals and notebooks that work just as well—longer, shorter, hardcover, blank, gridded, etc., etc. A key component of my system are David Seah’s Emergent Task Planner stickypads . Below, I describe my STJ and LTJ setup. This will give you a decent idea about how to set up your own. If you are interested in more detailed explanations, you can check out my book , sign-up for a free e-mail course , or Tweet/DM me @mjmottajr . I organize both journals so they function front—to—back for one purpose and back—to—front for another. This prevents needless flipping-through to find the right page. The middle-third of each monthly page is for a review, written at the end of the month. How did it go? Where did I succeed and fail? What affected my results? The bottom-third is for adjustments and thoughts for the following month. What did I learn? What should I modify going forward? Daily Journaling The first 60 pages are dedicated to daily journaling, although pages do not correspond to particular days as you may write more or less on any given day. 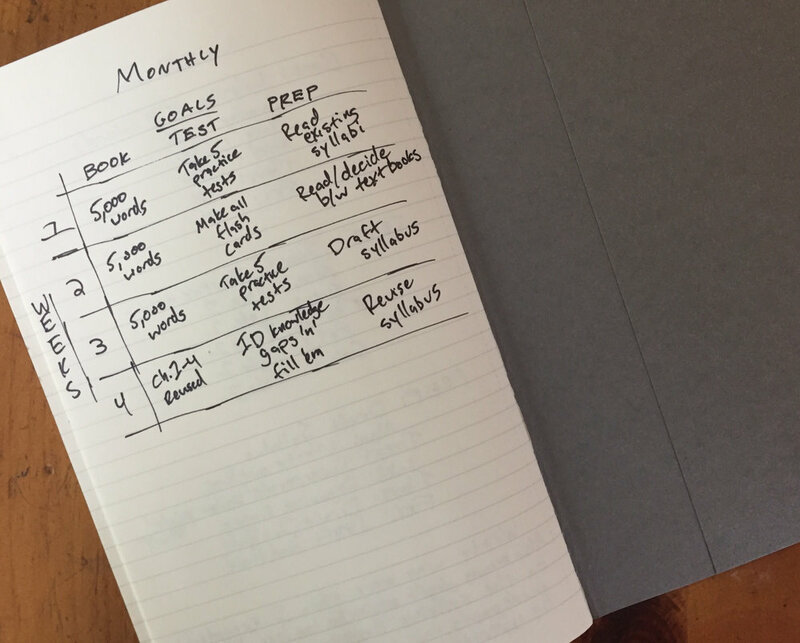 Start your productivity journals today! If you are interested in more detailed explanations, you can check out my book, sign-up for a free e-mail course, or Tweet/DM me @mjmottajr.